Capacitor Discharge spot welders are one of the most cost-effective welding solutions for fine-spot resistance welding. 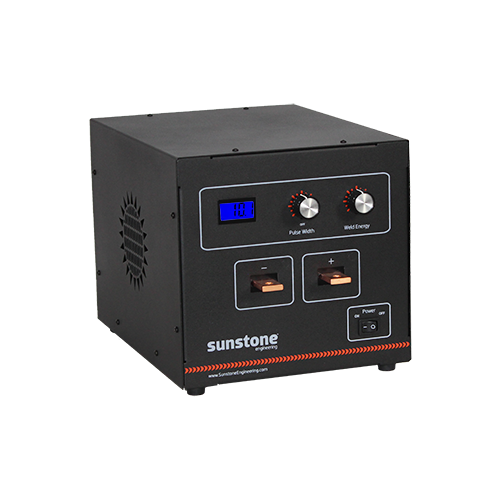 Whether you are manufacturing battery packs or microscopic assemblies, Sunstone Capacitor Discharge spot welders are the most affordable, precision fine-spot resistance welders on the market. Sunstone’s Single Pulse resistance spot welders are engineered to provide a wide range of welding flexibility for micro spot resistance welding. These single pulse welders can provide as little as 0.1 watt seconds (joules) of energy for welding microscopic wires and parts, or can deliver up to 100 or 200 Joules (depending on model) for stronger welds. These welders are versatile and easy to use for many micro spot resistance welding applications thanks to a simple user interface. The welder can be operated at up to 120 welds/minute. 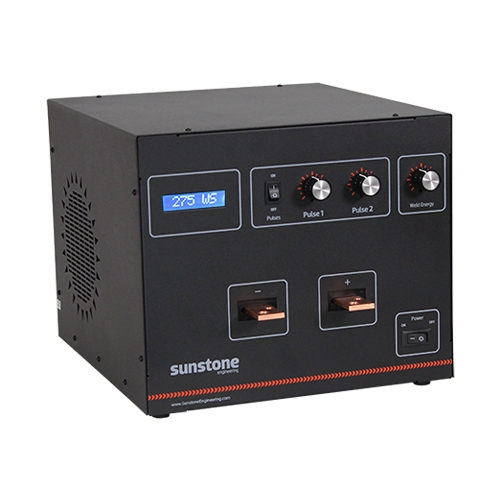 Sunstone’s Dual Pulse Capacitor Discharge Fine-Spot Resistance Welders provide the ideal resistance spot welding equipment. The 200, 400, and 600 watt second fine-spot resistance welders provide ample power for a large spectrum of applications, including battery pack manufacturing, at an affordable price. The welders’ dual pulse feature aids in the welding process. The first pulse heats the weld area to eliminate contaminants and then seats the weld electrodes. The second pulse is a higher energy weld that performs a clean, strong weld. Both pulses occur within milli-seconds. The 1000ws and 1100ws Dual Pulse Industrial Capacitor Discharge Spot Welders provide a substantial amount of weld energy along with a fine range of power adjustment. These welders provides up to 1000 or 1100 watt-seconds of energy for thicker, more conductive, and highly-resistive materials. Weld energy can be adjusted by increments of 10ws making it extremely versatile for a variety of applications. 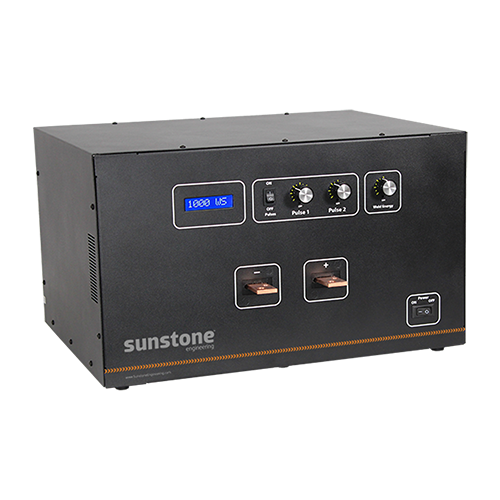 As with Sunstone Engineering’s other dual pulse spot welders, the 1000 and 1100 watt second spot welders produce clean, strong welds. Each pulse can be adjusted to control the amount of energy released, and can be turned on/off independently. Pulse one heats the weld area to eliminate surface contaminants and to seat the welding electrodes. Pulse two provides the energy to form the actual weld. Both pulses occur almost simultaneously with each weld initiation. When combined with Sunstone’s new line of weld heads, the CD1000DP can form strong, precise, and repeatable welds. Contact us to learn more about this product. Visit our YouTube channel to see 48 videos of CD welders in use.